My wife recently read an article titled “Bear Dogs of El Paso” in a Texas magazine. The second sentence stated that “these ancient mammals” were “ancestral to both bears and dogs.”1 She wanted to know if fossils really show this, so I started digging. 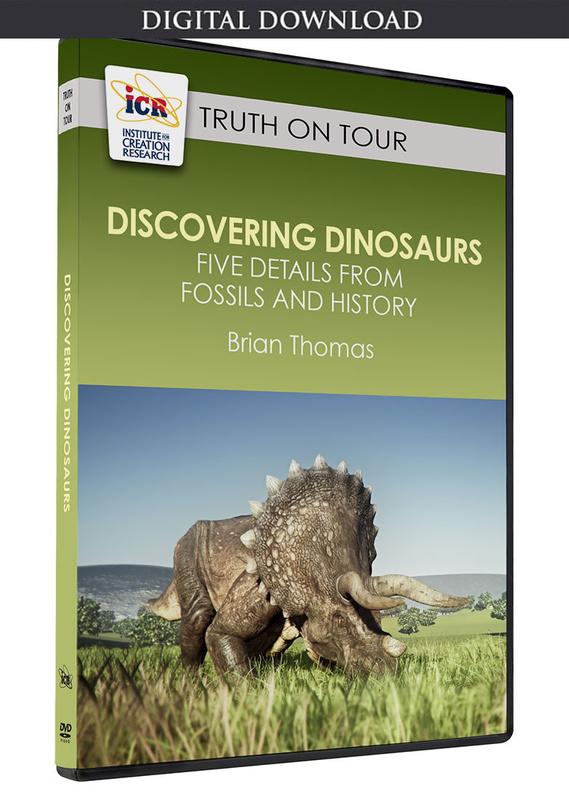 The article cited paleontologist Susumu Tomiya and anatomist Jack Tseng. A search for their names found a 2016 technical report on beardogs written by them in the journal Royal Society Open Science.2 The pair re-analyzed two fossils previously labeled as generic carnivores by other scientists. New CT scans showed skull features that suggested both fossils belonged to the specific category of carnivores called beardogs. Does the name mean beardogs evolved into dogs or bears? Not at all. Here’s what I found. 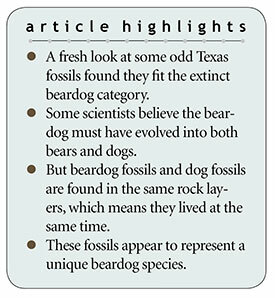 Beardog fossils and dog fossils are found in the same rock layers, which means they lived at the same time. First, near the end of the “Bear Dogs” article, the author quotes Tseng as saying, “Bear dogs and true dogs shared a common ancestor…but there is little evidence that true dogs are direct descendants of bear dogs.”1 Wait, what? If there is little evidence that dogs evolved from beardogs, then why did the author write earlier in the article that beardogs were dogs’ ancestors? These statements clearly clashed, so I needed to learn more. So, like Tseng, this evolutionary author admits that beardogs are only distant relatives—not ancestors—of dogs. A University at Buffalo summary of the 2016 Royal Society report said that beardogs have a characteristic bone-enclosed space in their skulls near the ears.4 Tseng and Tomiya found these spaces in their tiny, Chihuahua-size Texas fossils. An earlier 2001 study compared small beardog skulls to actual dog skulls. It said, “From their earliest appearance, canids [dogs] fully enclose the auditory region.”5 But if dogs evolved, shouldn’t early ancestors have less dog-like characteristics? Instead, dogs have remained dogs, just as amphicyonids stayed true to their own form. The 2001 report also noted that the same rock layers that have amphicyonids have even more dog fossils in them. How could one evolve into the other if they lived at the same time and place? I needed no fossil expertise to determine that beardogs show no real evolution. All I had to do was read the secular scientists’ own conclusions. I told my wife that despite what her article said, four different evolutionists admitted that beardogs probably did not evolve into modern dogs. Now she’s writing a letter to the editor about the article’s inaccuracy. Beardogs were not dogs, bears, or ancestors of either. 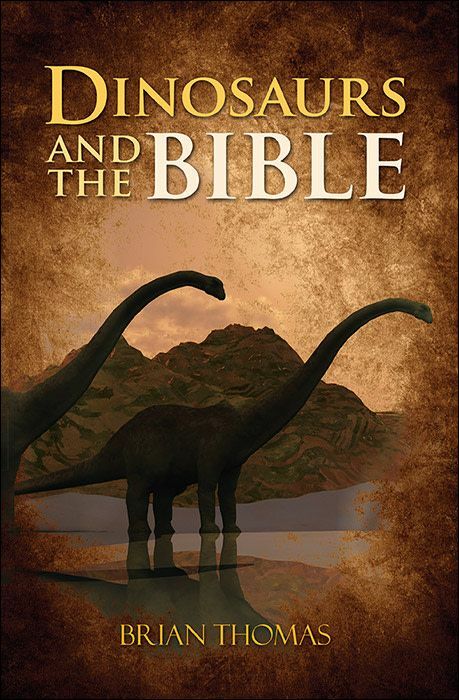 Fossils agree they were their own created kind. Deeringer, M. Bear Dogs of El Paso. Texas Co-op Power, June 29, 2018. Tomiya, S. and Z. J. Tseng. 2016. Whence the beardogs? Reappraisal of the Middle to Late Eocene ‘Miacis’ from Texas, USA, and the origin of Amphicyonidae (Mammalia, Carnivora). Royal Society Open Science. 3: 160518. Perkins, S. ‘Bear dogs’ once lived in southern Texas. Science News. Posted on sciencemag.org October 11, 2016, accessed June 1, 2018. Goldbaum, E. From unknown to beardog: Findings rescue fossils from “trashbin” genus. University at Buffalo News Center. Posted on buffalo.edu October 12, 2016, accessed June 1, 2018. Hunt, R. M., Jr. 2001. Small Oligocene Amphicyonids from North America (Paradaphoenus, Mammalia, Carnivora). American Museum Novitates. 3331: 18. Image credit: Copyright © T. Batar. Used in accordance with federal copyright (fair use doctrine) law. Usage by ICR does not imply endorsement of copyright holder. Cite this article: Brian Thomas, Ph.D. 2018. Beardogs: Bears, Dogs, or Something Else?. Acts & Facts. 47 (8).